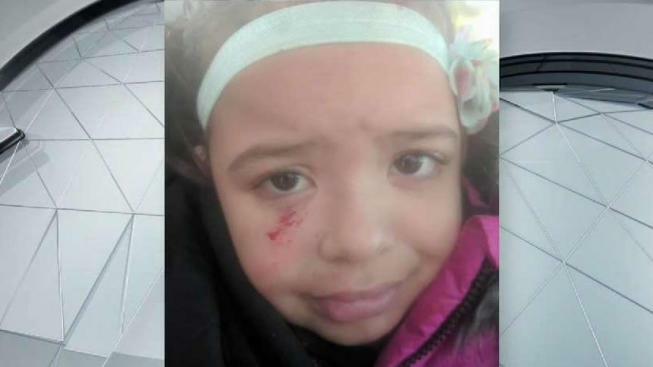 A 6-year-old girl was inside a car when she was injured by a piece of ice that came off a tractor-trailer and smashed the windshield. A 6-year-old girl was injured when a large piece of ice flew off a tractor-trailer and hit the windshield of the vehicle she was riding in Thursday afternoon on Interstate 495 in Andover, Massachusetts. State police said they received several calls reporting a large piece of ice flying off a tractor-trailer on I-495 north and smashing the windshield of a 2018 Toyota. Amanda Grenier's young daughter, Avery, was taken to Lawrence General Hospital with minor injuries. "She's OK. She's just shaken up," Grenier said. While she is relieved that she and her daughter are OK, she was angered by the lack of action from the driver. "It could kill somebody. It almost killed me and my daughter," Grenier said. "If I didn't swerve, it would have gone right through my driver's side and my daughter would have been left without a mom." A witness to the incident called state police with the license plate of the truck, and they said an investigation is ongoing. No further information was immediately available. A similar incident was reported on Route 202 in Henniker, New Hampshire, earlier Thursday. Photos shared on Facebook by Henniker police showed a vehicle with a shattered windshield. Henniker police said they are looking for a witness they spoke with who was driving a black Dodge Caravan who left before they could get his contact information. New Hampshire State Police said they stopped 21 vehicles on Wednesday, issuing 19 traffic tickets for violating Jessica's Law, which requires drivers to clear their vehicles of snow and ice. The law was enacted in 2001 following the death of 20-year-old Jessica Smith, who died when ice flew off the top of a truck and struck another vehicle, causing a crash involving her car.